The Vessel Specification is the central document from which any boat gets built. A complete Vessel Specification is available with most of the Study Plans listed on my Power Boats Gallery and Sail Boats Gallery pages. The Vessel Specification is therefore an integral part of a complete Study Plan. Michael Kasten. 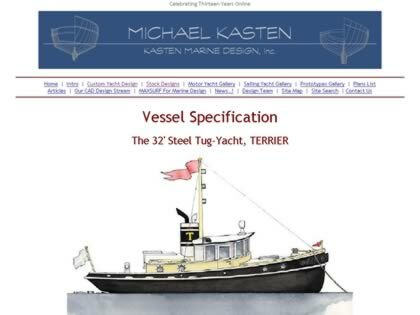 Web Site Snapshot: If available, above is a snapshot of the Vessel Specification web site at http://www.kastenmarine.com/terrier_vessel_spec.htm as it appeared when this site was added to the directory or last verified. Please Note that Boat Design Net has no involvement with the above web site; all content and images depicted in the above thumbnail are the property and copyright of Vessel Specification unless otherwise noted on that site. Description: The Vessel Specification is the central document from which any boat gets built. A complete Vessel Specification is available with most of the Study Plans listed on my Power Boats Gallery and Sail Boats Gallery pages. The Vessel Specification is therefore an integral part of a complete Study Plan. Michael Kasten.